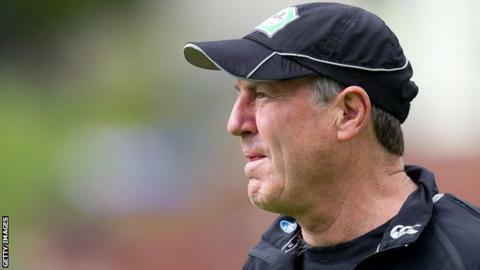 John Wright guided Derbyshire to their first T20 quarter-final since 2005 last season. John Wright and Dominic Cork are returning to Derbyshire to guide their challenge in this summer's T20 Blast. Wright, who returns as specialist coach, masterminded a club record eight T20 wins for Derbyshire as they reached the quarter-finals last season. Former Derbyshire and England bowler Cork returns as T20 bowling coach. "We are delighted to have John and Dominic back as specialist coaches for the Vitality Blast this summer," said Derbyshire cricket advisor Kim Barnett. Wright has a wealth of coaching experience with India and his native New Zealand, as well as leading Mumbai Indians to the Indian Premier League and Champions League double in 2013. Cork, who captained Derbyshire during his 13 years at the club as a player, first carried out the specialist T20 bowling coach role last summer. "We saw great progress in the shortest format in 2017, securing a home quarter-final for the first time and playing a positive brand of cricket throughout the competition," added Barnett. "John, Dominic and all the players are determined to build on the successes from last summer and our ultimate aim is to reach Finals Day and bring silverware to Derbyshire."